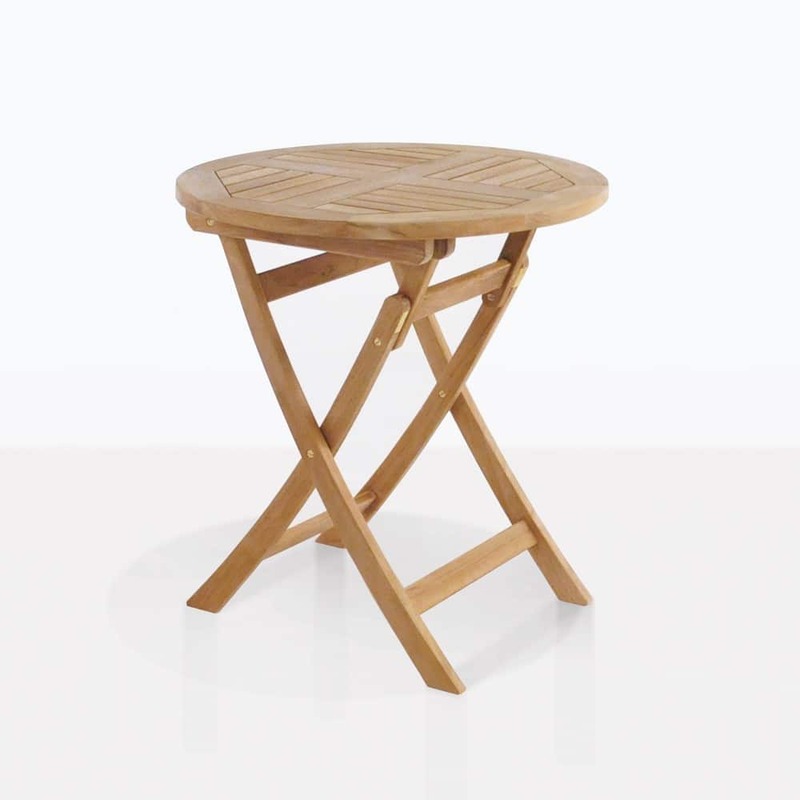 The ultimate in flexible folding tables; Teak Warehouse’s Round Teak Folding Tables are the perfect side or dining tables for the home or outdoors. In 6 convenient sizes, these tables range from a smaller 27 inches all the way up to a generous 51 inches, enabling you to format an ideal setup that suits your space and cater to many guests. Not only do you get the option of choosing a size that suits, but each table folds down flat for convenient storage, making it easy to enjoy a smaller space or open up a larger area. Constructed out of A-Grade Teak with brass rivets and fittings, these simply divine Round Teak Folding Tables will stand the test of time due to the premium quality of materials and clever design. A-Grade Teak has long stood as the ultimate choice for constructing outdoor furniture. Bearing the greatness of a 40 plus year old teak tree, each piece of wood holds substantial amounts of rubber and oil throughout, all coming from this beautiful, aged tree. Whether you let them weather or not, Teak Warehouse’s teak furniture will continue to be smooth to the touch, strong and long lasting. Low in maintenance, we encourage you to simply clean your furniture a few times a year. A bucket of soapy water, a sponge or brush, follow the grain of the wood and your pieces will be good as new! If you prefer to keep the honey color, invest in a marine grade sealant or oiling product – all available at your local marine store. Tell them you’ve got A-Grade Teak and what finish you require and they’ll set you up with an easy to apply product! Teak Warehouse has been supplying luxurious teak products for over 20 years. The quality is backed up by our many loyal customers, businesses and designers that have continued to buy from us and recommend us, helping us grow to the nationwide represented company we are today! And our ‘material portfolio’ has now expanded to other marine quality outdoor furniture! Choose from an incredible range of pieces that include sun loungers, tables, arm and side chairs, deep seating, umbrellas, and relaxing chairs made out of materials such as Batyline® Mesh, #316 Stainless Steel, Viro® wicker, Sunbrella® fabric and many, many more. 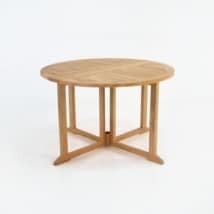 Whether you are after one of these fabulous Round Teak Folding Tables or any of our other stunning products, we can have a quote ready for you within a day, including shipping cost and information on delivery times. Call or inquire online now! These pieces are portable, easy to fold away and set up and being excellent quality; require very low maintenance. The classic pin-wheel design is a beautiful, elegant and timeless style that goes effortlessly with modern, crisp mid century styles as well as the traditional home. 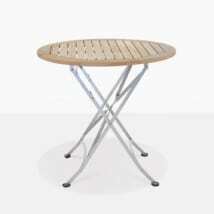 These fabulous Round Teak Folding Tables are also a superb choice for indoors as well as out! Use a smaller 27 inch as a serving table for larger dinner parties or as a gorgeous addition to your sun room or covered patio. Love eating breakfast as a family but don’t want to mess up your dining room? Be bold and place a large 51 inch as a breakfast table for the petite kitchen, fold it up after your cereal and open up the space again! Voila! Refined breakfasts on the go with no fuss! 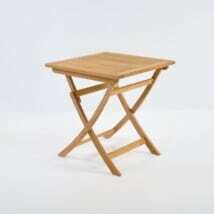 Purchase one of these folding tables in this excellent round style or investigate one of our square options! We really do have 100’s of options to suit your space! Wanting to create an excellent modern dining set? Pair up the Round Teak Folding Table with one of our concrete square or round stools or perhaps one of our wicker chairs for a complimentary mix of materials that will add a touch of contemporary flavor to your outdoors! At Teak Warehouse, we offer a fantastic selection of folding teak chairs, to complete a chic and classic look you will be proud of. Imagine in the garden surrounded by all of your favorite flora and fauna or on your impeccably designed modern patio for a touch of dignified elegance. The Round Teak Folding Tables are available from our 3 flagship stores in California to be picked up or delivered today (also available online to anywhere in the U.S. via our website). Order yours now!